The LifeSource line of digital blood pressure monitors (automatic and manual inflate), enable people with hypertension (high blood pressure), diabetes or those who have an irregular heartbeat to accurately monitor their blood pressure at home. 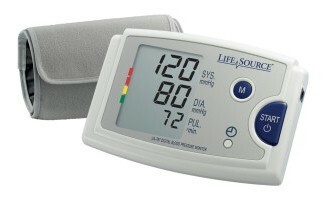 LifeSource's Clinically Validated blood pressure monitors assist physicians in the diagnosis and management of hypertension and related disease states (obesity, high cholesterol, kidney disorders). Home monitoring combined with exercise can help maintain a healthy heart. LifeSource monitors include a Lifetime Warranty, free logbook and large-print trilingual instruction manual.